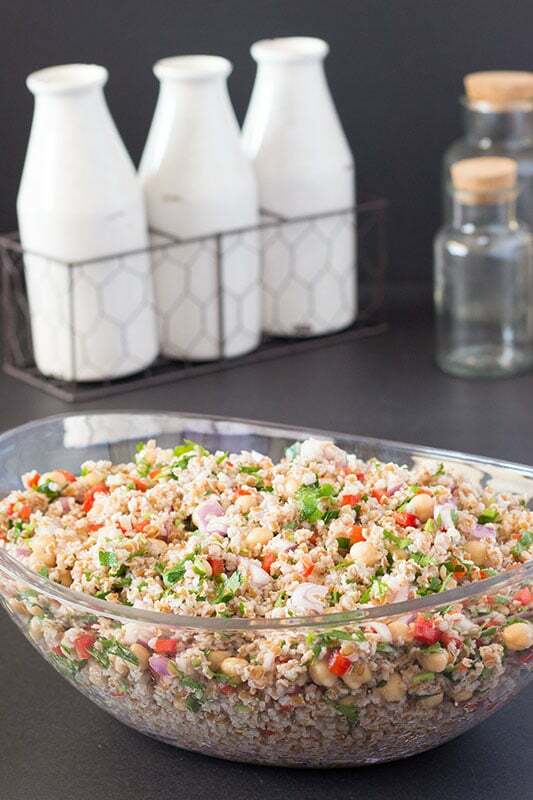 Vegan Bulgur Chickpea Salad with lots of olive oil, cucumbers, and peppers is a healthier side dish option with a bonus. It can be served at room temperature. Great for picnics, potlucks, tailgates, and anywhere refrigerator space is limited. Yes, the title is spelled correctly. 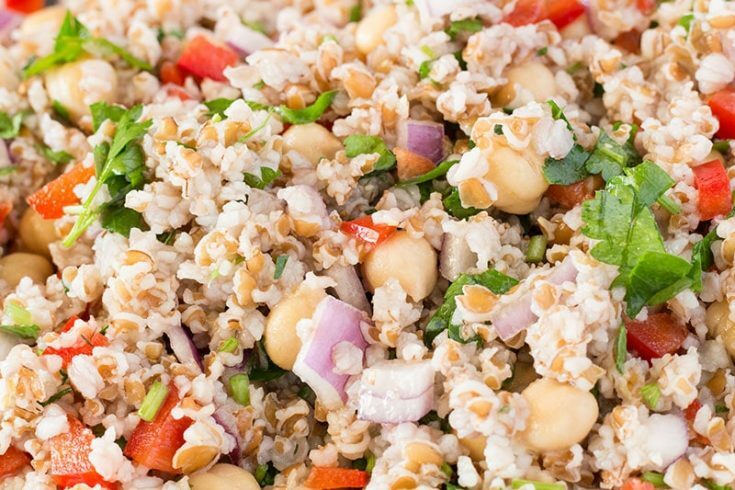 It is Vegan Bulgur Chickpea Salad, not Bulgar Salad. You might be tempted to spell it Bulgar, but the correct spelling is Bulgur. Bulgars were a group of people and were proto-Bulgarians. Bulgur is cracked wheat. I assure you, I do not use proto-Bulgarians in my recipes! Vegan Bulgur Chickpea Salad saved the day for me in a potluck situation. I needed a recipe that could easily serve quite a few people. Normally, I have a difficult time deciding which recipe to make, since I have so many. But this situation left me at a loss for what I could make. You see, there were so many variables and criteria that needed to be met. It was needed for a barbecue-themed potluck that would be served over several hours because people would be getting their meal breaks at different times. It would also be several hours between arriving at my destination and food service. Refrigerator space was going to be severely limited, and carrying a slow cooker to the destination was not possible. The slow cooker I have is old and heavy. I have my eye on this slow cooker with a locking lid and the insulated travel bag. The last criteria was a new one for me. There was going to be an ethical vegan eating at this potluck. If you are wondering what an ethical vegan was, you aren’t alone. I have asked many questions about this way of eating and still only know the basics. Eat Like You Give a Damn is a great cookbook to start with if you or someone you know has moved to an ethical vegan diet. I wish I had owned prior to this potluck. With my very limited understanding of this way of eating, I knew I needed to find something that had absolutely no animal products in the recipe. No eggs, no dairy, and obviously no meat, but this also excludes honey. If you have read any of our recipes, you know that there is a good possibility that I have no recipes beyond hummus that would fit that bill. Hummus was not an option as I was committed to a side dish. A friend suggested I make tabbouleh, but I really dislike that much parsley in any one dish. I can’t get past the overwhelming feeling that I am eating lawn clippings. Don’t get me wrong, I love fresh parsley and grow my own during the summer. It brings great fresh flavor to my dishes, I just do not like mass amounts of it. Vegan Bulgur Chickpea salad was the perfect fit. 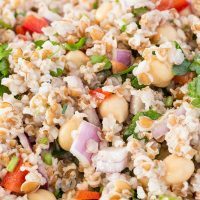 Bulgur and chickpeas combined with sturdy vegetables like red peppers, onions, and cucumbers would hold up to the acidity of the lemon juice. I have left out the dill and the cumin, personal preferences here again. Thanks to Jenn Segal over at Once Upon a Chef for the inspiration and base recipe to start with! 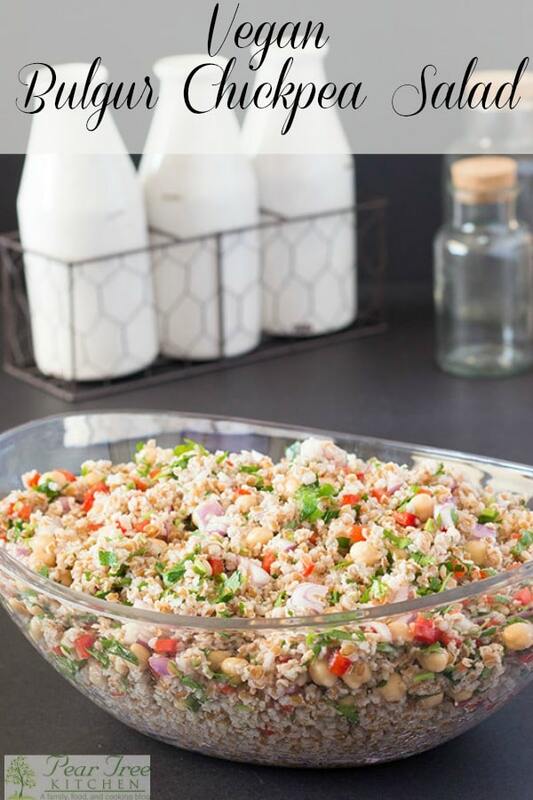 Easy vegan recipe for a bulgur salad with chickpeas, cucumbers, red peppers, and parsley that can be served at room temperature. Will feed a crowd. Place bulgur and 1/2 tablespoon salt in a large mixing bowl. Boil 6 cups of water in a pan or microwave. Pour boiling water over bulgur and stir, making sure all bulgur is underwater and salt is distributed. Allow bulgur to sit in water until water is absorbed, 60 to 90 minutes, bulgur will swell considerably. If vegetables have not been chopped, prepare those while waiting. When bulgur is done, fluff with a fork and allow to cool. Once bulgur is cooled, fluff with a fork one more time. Add chickpeas, onions, red pepper and cucumbers to the bowl and mix well. Juice the lemons and strain out any seeds. Add to bulgur salad and stir well. Drizzle olive oil over salad, add the last 1/2 tablespoons of salt and mix well. Finally, add the parsley and again stir well. Taste and adjust by adding more lemon juice, olive oil, parsley, and salt as desired. This salad may be served cold or at room temperature. Vegetables can be substituted with those of your choosing. I do not leave this out for more than a day. Refrigerate leftovers, bringing it back to room temperature before serving. NOTE: We are not certified nutritionists, the nutrition details provided above are for reference only, as they are only as good as the recipe analyzer used at the time of posting. You are encouraged to re-calculate the data.